You may be here looking for a stretching exercise for hip due to tightness, pain, or just general health. Whatever your reason for wanting a hip stretching exercise I will erase the confusion and differentiate for you the stretches for specific muscles. Stretching the piriformis muscle is recommended for symptom relief that may stem from Sciatic Pain. Only stretch to the point of pain not into it! The best hip stretching exercise for the piriformis muscles(deep in the buttocks) is lying on your back with a long rope or strap you can loop around your foot. Lift your leg straight up so it is perpendicular to your body or close to it. Aim the bottom of your foot to the ceiling. Grab the rope with the opposite hand of the leg looped and bring your leg across your body and straight down towards the floor until your hip begins to roll up. 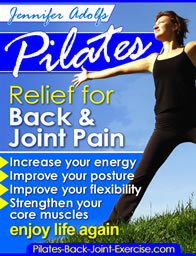 Feel the muscles of the inner thigh and abdominals contract as you stretch this muscle group. Keep slight tension on the rope. Hold for 2-3 seconds then relax to prepare for the next stretch. Repeat 10 times holding for a 2-3 count again only to the pain not into it. Tightness in the hip flexors or front of the leg and hip should include a stretching exercise for hip muscles of the psoas and quadricep groups. I love to use the Pilates Reformer to get a good hip flexor stretch and to strengthen the hamstrings simultaneously. Position yourself with one knee on the reformer and the other foot on the carriage as shown to the right or on the floor under you. I use about 1 1/2 spring for the tension. With your hands on the foot bar press out through the kneeling leg until the pelvis moves down and opens the front of the leg stretching the hip flexors, then press out more with the front leg until you feel the back of that leg stretch. Hold the position as you transfer weight into the front leg and then resist the springs coming back in to start position. Repeat on each leg for 4-6 repetitions. Find this exercise and my Pilates Reformer lower body workout video from this page. Hip Abductor Stretch (including the IT Band and the deep gluteal muscles in the hip joint). Position: Sitting tall with one leg crossed over the other as shown in picture. Movement: Inhale as you rotate turning towards the bent knee and grabbing the outside of the bent knee as you twist to get more stretch. Exhale hold and then inhale to release back to the center. Repeat this rotation hip stretch 4-6 times on each leg breathing in out as you hold and release. Leave stretching exercise for hip and find more articles and information on how to work your hip muscles.